Hundreds of thousands of bacterial species exist on Earth. They can be found in very diverse environments ranging from cold to hot and alkaline to acid. They live in soil, in water, and on rocks. They exist deep in the earth, high on mountains, and in deep-sea vents. They grow on and in other bacteria, worms, insects, plants, animals, and people. Bacteria are prokaryotes . Prokaryotic cells possess simpler structures than eukaryotic cells , since they do not have a nucleus , other membrane bound organelles , or a cytoskeleton . Bacterial cells have two major compartments, the cytoplasm and cell envelope, and may also have exterior appendages , such as flagella or pili. There are two major types of prokaryotes: bacteria and archaea. Archaea (also called archaebacteria) are often found in extreme environments, and while they are clearly prokaryotic, they have evolved separately from bacteria. Mitochondria and chloroplasts are two membrane-bound organelles carried within eukaryotic cells that are thought to have been derived from free-living prokaryotic organisms that became irreversibly engulfed by ancestral eukaryotes. 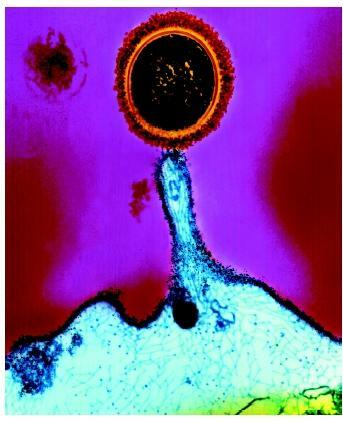 A colored transmission electron micrograph of Streptococcus bacteria attached to a human tonsil cell. Bacterial cells grow by a process called binary fission: One cell doubles in size and splits in half to produce two identical daughter cells. These daughter cells can then double in size again to produce four sibling cells and these to produce eight, and so on. The time it takes for a bacterial cell to grow and divide in two is called the doubling time. When nutrients are plentiful, the doubling time of some bacterial species can be as short as twenty minutes. However, most bacterial species show a doubling time between one and four hours. A single bacterial cell with a one-hour doubling time will produce over 1 million offspring within twenty hours. If left unchecked, a single E. coli bacterium replicating once every twenty minutes could replicate to equal the mass of Earth in twenty-four hours. The enormous increase in cell numbers that accompanies this exponential growth provides these simple unicellular organisms with an incredible growth advantage over other unicellular or multicellular organisms. Luckily, there are always limits to bacterial growth. The cytoplasm of a bacterial cell contains the deoxyribonucleic acid (DNA) molecules that make up the bacterial genome (or nucleoid), the transcriptional machinery that copies DNA into ribonucleic acid (RNA), and the ribosomes that translate the messenger RNA information into protein sequence. Since there is no nucleus, all of these processes occur simultaneously. The rapid growth rate of the bacterial cell requires constant DNA replication and ways to segregate the two new chromosomes into the two daughter cells without tangling them. Bacterial cells express a variety of shapes and sizes. The smallest bacteria are the Mycoplasmas, which range from about 0.1 to 0.25 micrometers in diameter, while the gigantic Epulopiscium fishelsoni is 250 micrometers long and visible to the naked eye. Some bacteria have a coccal (spherical) shape. 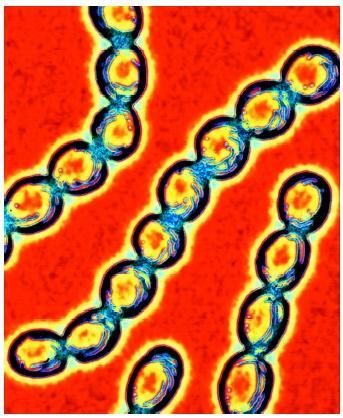 Others are shaped as bacilli (rods), vibrio (curved rods), or spirochetes (spirals). Bacterial cells are often classified by the structure of their cell envelope. All bacteria have a bilayer membrane that surrounds the cytoplasm. Integral membrane proteins within the cytoplasmic membrane are required to transport nutrients (sugars and amino acids ) into the cell for growth. Most bacteria have a cell wall that is made up of peptidoglycan . The exceptions are the Mycoplasma species, which only have a cytoplasmic membrane that is unique in the prokaryotic world due to the presence of the lipid cholesterol. The peptidoglycan molecule is made up of chains of sugars (glycans) that are attached to one another by peptide (amino acid) cross-links. This is a naturally occurring polymer , similar to chemicals that make up plastics and synthetic fabrics. Peptidoglycan it is only found in bacterial cells. The beta-lactam antibiotics (penicillin, ampicillin, amoxicillin) act to prevent the peptide cross-links from forming, which makes them active in preventing the growth of a diverse number of bacteria. Most bacteria are classified by how they react to a defined series of colored dyes (the Gram stain). The Gram stain is the basis of one major classification scheme for bacteria. Gram-positive bacteria have a thick cell wall with many peptide cross-links that allow a dark purple color to remain after the Gram stain procedure. The Gram-positive cell wall acts as a molecular barrier to prevent access to the cytoplasmic membrane and to keep large, harmful molecules from damaging the cell. In contrast, Gramnegative bacteria have a thin layer of peptidoglycan that makes up their cell wall that is surrounded by a second bilayer membrane called the outer membrane. The purple dye used in the Gram stain does not penetrate the outer membrane, and these cells do not stain purple. Gram-negative cells are instead identified by a pink color contributed by a different chemical stain during the Gram stain procedure. The Gram-negative outer membrane functions to protect the cytoplasmic membrane. The outer membrane contains porin proteins that form holes in the outer membrane to allow small molecules (sugars, peptides, salts) to enter the area between the two membranes (the periplasm). A colored transmission electron micrograph of Streptococcus pyogenes bacteria. system as a microbial product (endotoxin). Since LPS in the blood stream can be fatal to mammals, all products that are used clinically within the bloodstream (such as insulin) must be endotoxin-free to prevent septic shock. Gram-positive bacteria express lipoteichoic acids in their cell walls that act similar to LPS on the mammalian immune system. Most bacterial species express other molecules and structures outside of their cell envelope that are important for interactions with the environment. Polysaccharide postmortem capsules prevent desiccation of environmental microbes and allow pathogens to resist phagocytosis by mammalian white blood cells. Most bacterial species have flagella, which allow the bacteria cells to move around in aqueous environments. Most Gram-negative bacteria express hairlike appendages called pili or fimbriae that allow them to adhere to other bacteria, bacterial viruses, eukaryotic cells, or other physical surfaces. Both Gram-negative and Gram-positive bacteria can express afimbrial adhesions that also allow adherence to a variety of molecules or surfaces. These exterior appendages help bacteria get to where they want to go, and then keep them there to facilitate growth. Most bacteria do not directly influence humans. However, a small number of bacterial species can cause human or animal diseases and are a major focus of scientific study. Other bacteria can be beneficial to humans by contributing to human nutrition and protecting the body from pathogens. The E. coli bacteria in our colons are an example. Bacterial cells such as E. coli are widely used in laboratories as factories to produce commercially or medically important proteins through the use of genetic engineering or recombinant DNA technologies. Other bacteria are important for agriculture since they take nitrogen from the air and replace it in the soil (nitrogen fixation). Bacteria are used to clean up oil spills and toxic chemicals in the environment. There are as many beneficial bacteria as there are destructive germs. Neidhardt, Frederick C., John L. Ingraham, and Moselio Schaechter. Physiology of the Bacterial Cell: A Molecular Approach. Sunderland, MA: Sinauer Associates, 1990. Tortora, Gerard J., Berdell R. Funke, Christine L. Case. Microbiology: An Introduction. Redwood City: CA: Benjamin/Cummings Publishing Company, Inc., 2001. This really helped me a lot with my college term paper about bacteria cells.